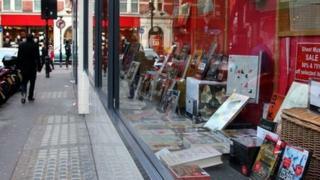 Sales of printed books fell by £98m last year - a drop of 6.5% from 2012. A total of £1.416bn was spent on paperbacks and hardbacks in the 52-week period up to 28 December, according to Nielsen BookScan data. The total number of printed books sold dropped even further - falling 9.8% to 183.9 million. A rise in the average price partly made up for the shortfall. The continued growth of the digital e-book market is in part responsible for the large drop in sales. Recent consumer data figures showed more than two million UK users joined the digital book market in the first nine months of 2013. However, The Bookseller said the fall in value of the book market was also due to the slowdown in sales of EL James's Fifty Shades novels. In 2012, the author's trilogy sold in record-breaking numbers. At its peak, the series accounted for almost half of all novels bought in the UK. James's sales for 2013 totalled £1.4m, compared to £47.3m in 2012, when the trilogy sold 10.5 million copies. Despite the overall market slump, the average selling price of a book reached a nine-year high, rising 21p to £7.70. Sir Alex Ferguson's My Autobiography was the best-selling book of 2013, shifting 803,084 copies, while the hardback version of Dan Brown's Inferno was the best-selling novel, with 640,676 copies purchased. Meanwhile, supermarket chain Sainsbury's has announced it is to stop selling printed books online by the end of February. "We see that the online opportunity lies in digital products, with physical music, books, games and films sold in our stores," a Sainsbury's spokesperson said. "This move is in line with wider industry trends towards on demand entertainment, and part of our focus on the fast-growing download and streaming market."